If you’ve ever flown, you know that one of the greatest hazards you will face, after crying children, people who blow their noses right next to you, and, of course, snakes, is dealing with airline food. Oh, not the part about whether it will be edible or not. Airline food has gotten surprisingly better since the days of early air travel when you had to wait to get your lunch until the plane stopped in Cedar Rapids for gas. No, airline food isn’t a meal at a five-star restaurant or anything, but if you catch the right airline, then you’ll very likely be offered up something that has some aesthetic appeal, comes with a brownie, isn’t bland on the old taste buds, and won’t (immediately) kill you. Given that last, though, and since the choice is also almost always pasta or chicken, go with the pasta. It (almost) certainly won’t kill you. The chicken, on the other hand? Well, chicken is suspicious. Go with the pasta. However, unless you’re sitting in First Class, once you have your food, you’re faced with a far greater dilemma than whether or not you’re risking salmonella. If you do generally travel First Class, then you’ve got nothing to worry about. Heck, you can even eat the chicken with impunity–not to say that it’s less likely to poison you, but if you can afford First Class, then you can also afford to get your stomach pumped when you get off the plane. Just have your chauffeur spin you on over to the private hospital, then you can get back to your weekend plans with one of the Hilton daughters. But if you’re anywhere else on the plane, then right after the steward puts your pasta platter on the fold-down tray in front of you, you have to figure out how to eat the bloomin’ stuff. I mean, it’s right there. You can smell it. You can feel the heat of it rising up off the Saran Wrap-sealed containers. You can certainly see it: there’s the pasta box, there’s the thing with the salad, there’s the roll, there’s the desert, there’s the cheese and the butter and the sealed baggie containing plastic-ware, napkin, and salt-and-pepper packets. But how do you eat it? The regular way, you say? You’re crazy. You must fly First Class. No, if you’re in the cattle car section of the plane, you are very likely stuffed into a seat that has your knees crammed up in front of you, pushing up on the tray that’s holding your food and threatening to spill it all onto the floor. On either side of you, there’s probably someone else eying their own platter, and their elbows are almost certainly poking into your ribs. A full range of movement is impossible. But you can’t very well dip your head down and start slurping. For one thing, you haven’t managed to get the plastic off the containers yet, so the best you’d be able to manage is to push everything around on the tray. Sure, you could start gnawing away at the roll, but how satisfying is one roll? There is a definite skill involved in eating onboard an aircraft while stuffed into Economy Class. It may require practice at home, but you can do this. First, and most important, is mastering the elbow tuck. Your seat mates aren’t doing it, so you’re going to have to. Pull those elbows in to your sides so that your forearms and hands stick out straight in front of you, kind of like a T-Rex’s. Your fingers should be hovering above the tray. As a bonus, your arms are now protecting your ribs from the assault of your neighbor’s elbows as they knife-and-fork their way into their chicken. Each time they do so, say, “Rawr, I’m a T-Rex!” This might–probably won’t, but might–earn you some extra space. At the very least, you now have access. But where to start? At home, you’d go with the salad first, then move on into the main course, followed by the dessert. It’s just the way things are done. But on a plane, convention must be thrown out through the hole in the window you’d better hope isn’t there. Instead, you’ve got to clear away the small stuff so that you’ll have room to work with that bubbly-hot plastic-sealed pasta. Go for the roll. No unwrapping to do, there, though getting to the napkin and the plastic-ware might be useful at this point and that’ll take some skill. Say, “Rawr” again and tear it open with your teeth. Once you’re ready, butter and cheese up the roll. Throw in some crackers from the salad, if you want. I like to set my roll on top of the pasta box to heat it up some (they usually come out of the serving cart with an internal temperature just slightly above that of that mammoth they found in Russia the other day). About that salad. Skip that. Even the best-looking salads I’ve seen on a plane still had brown lettuce in it. Don’t trust the salad…it’s friends with the chicken. You can, however, eat the desert at this point. Whether it’s a brownie, a cookie, or (and this really happened to me once and I recommend KLM because of it) strawberry shortcake, scarf it down now. At this point, there’ll be a lot of trash: all sorts of plastic-y things that will want to curl up on your tray and make the whole business lack something in the way of appetizingness. If you can get away with it, put this detritus on your neighbor’s tray while he’s busy elbowing someone else and isn’t paying attention. If you can’t get away with it, then I recommend stuffing everything under the salad container. Makes the salad good for something, anyway. Finally, you’re ready for the main course, which had better by-goolyhammer be pasta. Haven’t you been paying attention? Work the fork-to-mouth action as best you can. Meal consumed, you can now lean back, elbow the people next to you a few times for fun, and start tossing back your beverage of choice, which, because you’re on a plane, had better be alcoholic (there’s free wine and beer on all KLM flights; I’m going to buy stock in these people). After that, it’s just a matter of watching a movie or two until the stewards bring around breakfast and you can do the whole thing all over again. Just, for the love of all that is good and right in the world, don’t have the eggs. They’ll grow up to be chickens, you know. 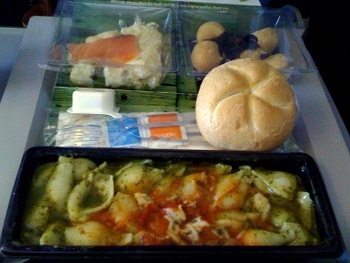 This entry was posted in How To, Observation Deck and tagged airline food, eating on an airplane, pasta vs chicken. Bookmark the permalink.